The HCFA 1500 form is considered to be professional paper claims form which is utilized by physicians and other medical service providers to submit claims for payment from Medicare carriers. The HCFA 1500 claim form enables the medical facilities to submit the health insurance claims to insurance carriers like Medicare and Medicaid; this form can be sent electronically. 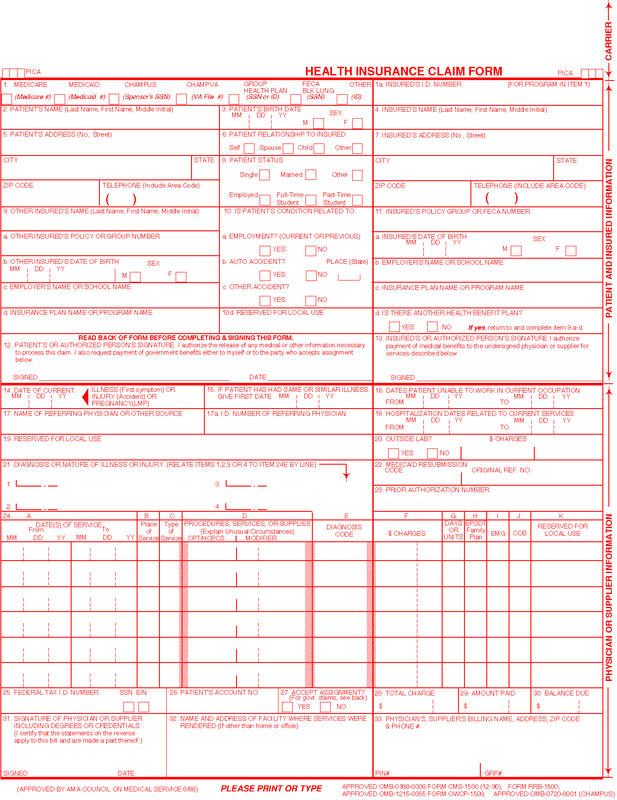 This form needs a lot of vital information about personal patient and insurance policy. The Centers of Medicare & Medicaid Services needs this form and renamed it Form CMS-1500. Managed care plans and private insurers utilize this form to bill and collect money from durable medical equipment regional carriers for services rendered. Providers have up to 1 year to submit the form in order to receive the payment. Medical service providers might fill out the paper form or electronically bill contractors. The HCFA 1500 claim form is considered to be the pre-HIPAA version of the form, on which entire medical providers sent claims to insurance companies, Tricare, and Medicare. all important provider identifying information. As the NPI numbers didn’t exist, there was no place to mention them on the claim. Provider identifying information is considered to be the integral part of a medical claim. If your provider is not in-network with the insurance company, then the insurance company will process the claim out-of-network. This means they might apply the permitted amount to the patient deductible, instead of paying for the claim. The similar thing will happen if the patient is needed to choose a primary care physician (PCP). If the patient visits a doctor that is not their PCP, then the insurance claim will differently process the claim. This commonly also results in a patient balance, because of a non-covered service. These necessary factors make it important for the identifying information of doctor to be on a medical claim. But unfortunately, the HCFA form did not have any space to involve this. The HIPAA’s implementation and the NPI needs made it important to re-design the HCFA 1500 claim form. This was completed and the new CMS 1500 claim form was put into use. This transformation happened in several phases, as the implementation date of both Provider NPI numbers as well as the CMS 1500 claim form was pushed back many times. Relying on your state, the transition away from HCFA was decided and finalized sometime between 2007 and 2008. After these dates were decided, entire insurance companies, the national government, and all medical providers are needed to utilize the CMS 1500 claims forms, complete with their NPI numbers.